Deborah DeMeritte decided to go into the refreshment services business when she found she was not able to find the type of food in vending machines that she wanted to eat. She spent a couple years researching ways to provide fresh food conveniently in the workplace before launching Simply Pure Inc., a refreshment services provider offering healthy food and beverages in Tempe, Ariz.
DeMeritte liked the micro market concept, but she felt existing offerings were very expensive for many locations. 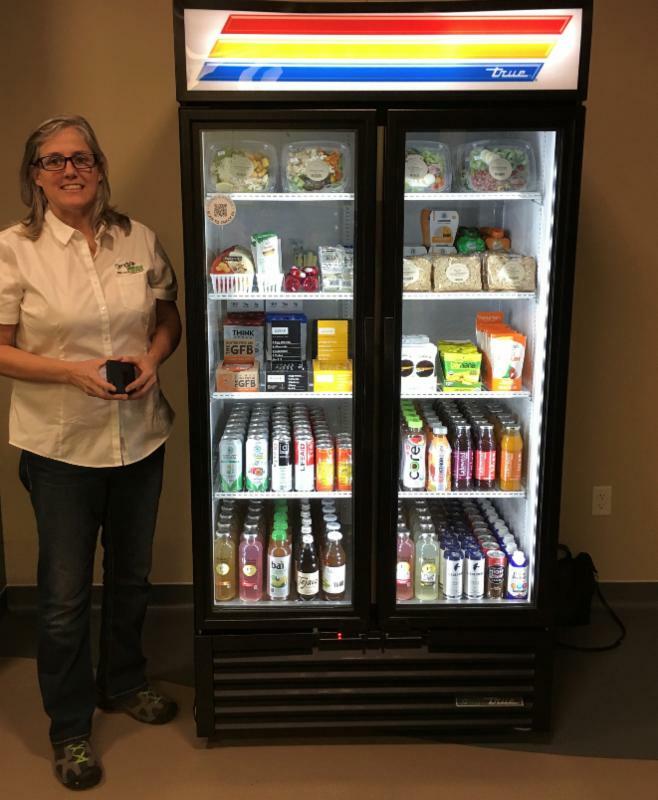 So rather than offering a kiosk micro market solution, she opted to provide a mobile payment app that customers can use to pay for products from cabinets and glassfront coolers. Customers simply download the Yoke Payments app and create an account on their mobile device. Once they log into the system, they can search for a product using the “look up item” function, select the product and check out using the app. They can also pay with a credit card if they registered their payment card on the app. Yoke, meanwhile, was working on a project to integrate its payment software with TriTeq’s electronic lock. When DeMeritte learned about this integration, she recognized the benefit of having controlled access for her glassfront coolers. Once the system accepts the payment, it automatically unlocks the cooler door, giving the customer 15 seconds to take the product from the cooler. The “smart” coolers are now the company’s focus, as DeMeritte, assisted by three full-time employees, is committed to providing healthy, fresh food. She does not use any frozen food, with the exception of one account that requested it. “Essentially, what we’ve created is a smart fridge vending machine,” DeMeritte said. She is currently using different size glassfront coolers, depending on the size of the location. The coolers typically cost around $1,600, buying direct from True Manufacturing, her current supplier. DeMeritte is considering using an iPad at a few locations, where some people may not want to use an app. If a location is closed to the public and has 100 people who are younger, the location is not likely to need a payment terminal. The TriTeq software also monitors the cooler temperature and all cooler door openings. DeMeritte likes being able to monitor connectivity and temperature in the coolers. “You’re able to go up and monitor the health of your refrigerator as well as lock it or unlock it,” she said. She also likes being able to remotely lock or unlock a cooler. The managers at her locations like the security feature since it reduces the likelihood of employees being tempted to steal from the glassfront cooler. DeMeritte is also able to check on a machine’s inventory at any time. Locations are serviced at least weekly to prevent spoilage. Some locations are serviced more frequently based on customer need. She has also been testing a camera in a refrigerator to record what is being removed. This will allow her to check what people take from the cooler against the payment log. Theft has not been a serious issue for DeMeritte, but it did cause her to pull out of one location after two weeks. Looking forward, DeMeritte plans to introduce ambient markets with the TriTeq lock. “There is an ambient cabinet that is being created to work with this system,” she said. She did not wish to reveal details about this system. The fresh food is delivered in dedicated deliveries on certain days. The micro market and coffee service deliveries are combined and delivered on other days.